The brand new 3 channel gyro mini metal RC helicopter is on of the world's newest, smallest and lightest RC helicopter you can get! At approx. 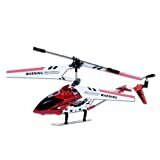 7.5" long, it easily fits in the palm of your hand and is fully functional, equipped with latest Gyroscope technology, which makes this helicopter an instant hot seller in the RC workd. This mini Gyro Metal Helicopter charges directly either from the USB cable or from the controller which uses AA batteries and has a full-function tril control for the perfect flight. --COLORS MAY VARY DEPENDING UPON AVAILABILITY!! Amazon Syma S107/S107G R/C Helicopter Pirce cutt bomb!!!! !